The Women in IT Awards today reveals the finalists for its fourth annual ceremony in London, which will convene over 1,100 business and technology leaders on 31 January to further the cause of improving diversity and inclusion in the IT industry. 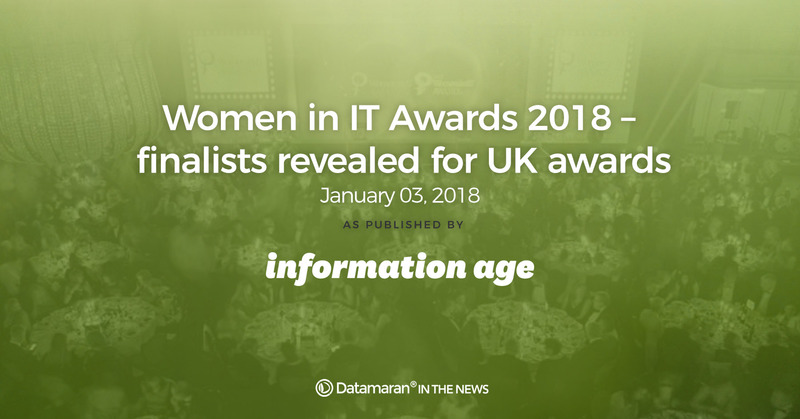 The awards programme, organised by Information Age in partnership with Amazon Web Services, is the leading initiative among extensive efforts from the tech world to rectify a gender imbalance that means women occupy just 17% of IT roles in the UK. The 2018 ceremony, hosted in Grosvenor House Hotel’s prestigious Great Room venue on Park Lane, will be the largest tech-related diversity event ever staged, pipping last year’s audience of 1,000 and bringing together the industry’s top stakeholders. The Women in IT Awards is the flagship event in an ongoing Information Age campaign to tackle technology’s diversity problems. Information Age has also launched a US edition of the event in New York, and runs two further diversity events in the UK: Tomorrow’s Tech Leaders Today, a careers fair for female university students, and Future Stars of Tech, which identifies and promotes the industry’s top female career climbers. Through a series of 19 awards, the Women in IT Awards showcases the achievements and innovation of women in technology and identifies new role models for girls, who made up less than 10% of those who studied A-level computing last year. Joining Amazon Web Services as sponsors of the Women in IT Awards 2018 are premium sponsors Salesforce and Yoox Net-A-Porter Group, diversity partner BMC Software, recruitment partner Frank Recruitment Group, as well as Accenture Security, Ada College, Auto Trader, Barclays, Bluewolf, Ciena, DocuSign, Expedia, Informed Solutions, KPMG, NFU Mutual, RBS, Rolls-Royce, SAP, Schroders, and Sky Betting & Gaming. Supporting partners include BCS, 30% Club, Tech Partnership, techUK, Tech Talent Charter and TeenTech. This year’s awards attracted over 700 nominations. The keynote speaker will be Baroness Lane-Fox, who co-founded Lastminute.com and now sits on the board of Twitter as well as chairing Doteveryone, a charity that fights for a fairer internet. “Since launching the Women in IT Awards we have been blown away by people’s passion and enthusiasm for this cause, driving the event to an incredible size of over 1,100 attendees in just a few years,” said Ben Rossi, founder of the Women in IT Awards and editorial director at Vitesse Media, publisher of Information Age. Click here to book your place at the Women in IT Awards 2018 in London, and here to view the winners of last year’s Women in IT Awards.